Nuclear Fusion: Success could mean almost limitless, relatively clean energy to power civilization. Don't miss this glimpse into the unknown. The sun was man’s first energy source, and fusion is what has kept the sun burning for nearly 5 billion years. But creating fusion power here on Earth has long been an elusive dream to scientists and science fiction fans alike, said Mat Kaplan, host of KPCC’s NEXT science series. If only we could make a fuel with relatively few pollutants and the ability to provide self-sustaining power for thousands of years. After 60 years of research and experiments, the dream is a lot closer to reality, but we still face some serious obstacles, according to the three scientists who joined Kaplan at KPCC’s Crawford Family Forum June 30 to discuss the future of fusion: Ned Sauthoff, director of the US ITER Project Office at the Oak Ridge National Laboratory; John Parmentola, senior vice president of General Atomics’ Energy & Advance Concepts Group, one of ITER’s suppliers, and William Heidbrink, professor of Physics & Astronomy in the School of Physical Sciences at the University of California, Irvine. For instance, ITER, the International Thermonuclear Experimental Reactor, is spending at least €13 billion during its 10-year construction phase to build a 23, 000-ton tokamak in Saint Paul-lez-Durance, France. A tokamak is a kind of giant hollow donut that uses powerful electromagnetic fields to hold the superheated plasma involved in fusion. The funding is being shared by ITER’s seven primary member nations—China, the European Union, India, Japan, Korea, Russia and the United States. Together, they represent 35 countries, and ITER is the first to point out that the €13 billion is just an estimate. But if they’re successful, the benefits could be world-changing. Based on the world’s annual energy consumption of about 500 quadrillion btu (quads), a self-sustaining fusion reactor could produce 16, 000 years of energy for world consumption, Parmentola said. And the waste from that electricity? But here’s the catch: Deuterium is easily pulled out of sea water, but tritium, which must be produced from lithium, is far more expensive, more than $100 million per kilogram on today’s open market, Parmentola said..
Sauthoff, who spoke via Skype, acknowledged the challenges, but thinks they eventually will be overcome. Our video of Kaplan’s 90-minute discussion has lots of details about the fusion process, the ITER project, and some of the obstacles that still need to be overcome to create fusion power. 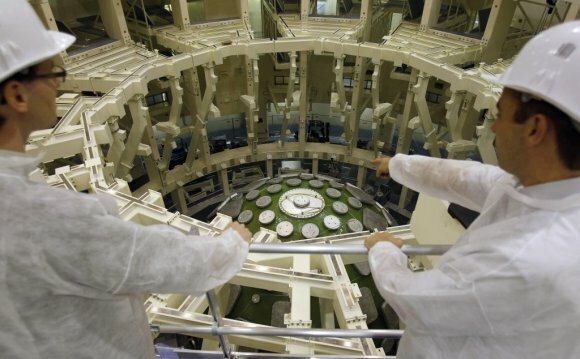 Bringing Star Power to Earth: Is Fusion Energy in Our Future?